Are you looking to dive into a career in healthcare where you play an essential role in the healthcare revenue cycle? Look no further! Medical coding may be the best fit for you. 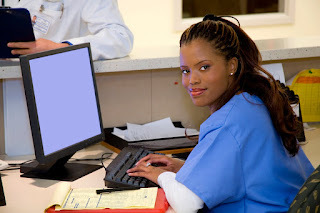 According to the American Academy of Professional Coders (AAPC), “medical coding is the transformation of healthcare diagnosis, procedures, medical services and equipment into universal medical alphanumeric codes.” In this field, you will be responsible for reviewing medical records and assigning diagnostic and procedure codes that are critical to accurate billing and timely health insurance claims processing. You’ll be doing important work in a growing industry while also being compensated generously. Classified under Medical Records and Health Information Technicians in the Bureau of Labor Statistics Occupational Outlook Handbook, the average salary for medical coders in Pennsylvania is $52,376.85. If this sounds like the career path for you, Peirce College is ready to get you there! Peirce offers a Certificate of Proficiency in Medical Coding which provides students with hands-on training with the latest medical coding systems and software. This program also positions graduates to sit for coding-specific certifications through the American Health Information Management Association (AHIMA) and the American Academy of Professional Coders (AAPC) due to the valuable, transferrable skills developed during the program. Certifications, specifically the Certified Coding Specialist (CCS®) and the CCS-P Certified Coding Specialist-Physician-based certifications, are highly encouraged by not only Health Programs faculty, but also industry-leaders because according to AHIMA, “Certified Coding Specialists are mastery-level professionals skilled in classifying medical data from patient records, generally in the hospital setting.” As a mastery-level professional, you are certain to land a position that matches your skill set and career goals. AHIMA offers the CCA, CCS and CCS-P exams; all worthwhile for a medical coder. These certifications in addition to the Certificate of Proficiency from Peirce College will prepare graduates to possess expertise in the ICD-10-CM and CPT coding systems, while also being knowledgeable in medical terminology, disease processes, pharmacology, health information documentation, data integrity and much more. Earning a Certificate of Proficiency in Medical Coding from Peirce College will set graduates up for success with earning the required certifications to become a top-level professional in the healthcare industry. To learn more about the Certificate of Proficiency in Medical Coding program at Peirce College, reach out to our Peirce’s Admissions Team today at 215.670.9000 or admissions@peirce.edu.